People sometimes ask me what we eat for dinner. They assume it’s only pasta every day. And that’s not far from the truth. There are some days we have fish and some days a stir-fry. The rest of the days there may be pizza or a really fun chicken dish. Like this recipe. The rest of the evenings will probably include pasta. I don’t follow any specific recipes when I put together my sauces for the chicken. I sometimes open the fridge and see what sauce I have. I check out what jams I have around or citrus fruits. Most of the time I like to use our homemade mango jam with the soy sauce for a really great sticky sauce. I was distracted by the gorgeous tangerines I had around and thought with a little garlic, this will be incredible. It’s sort of how I make my whole roasted chicken. It’s a little riff on it. I occasionally add a little mustard to that sauce. You can really use your imagination and get creative. But don’t forget the garlic because it really makes the dish and it smells incredible while it’s roasting. And what about on the side? With this chicken we had a very simple jasmine rice and a super delicious cauliflower salad. I hope to share that with you sometime next week. I don’t add any salt to the chicken. The soy and teriyaki add enough, in my opinion. But you could always use your judgement and add it if you prefer it a little more salty. I knew my kids would have zero patience while I took a photo of this dish. I took a few when I added the tangerines and everyone was yelling at me to hurry up because they were hungry. See, that’s why I don’t usually post savory recipes. Those of you that do, I want to know your secret and how you keep your customers calm while they’re waiting for you. I sometimes add a little water to the sauce when I baste the chicken if it seems it’s getting too dry. My kids like to dip their bread in the sauce so there always has to be a little extra. The last photo was when it was done and it was very quick and there was more screaming, “Mom, hurry up!”. So here you go…a really delicious chicken recipe that is no fuss. 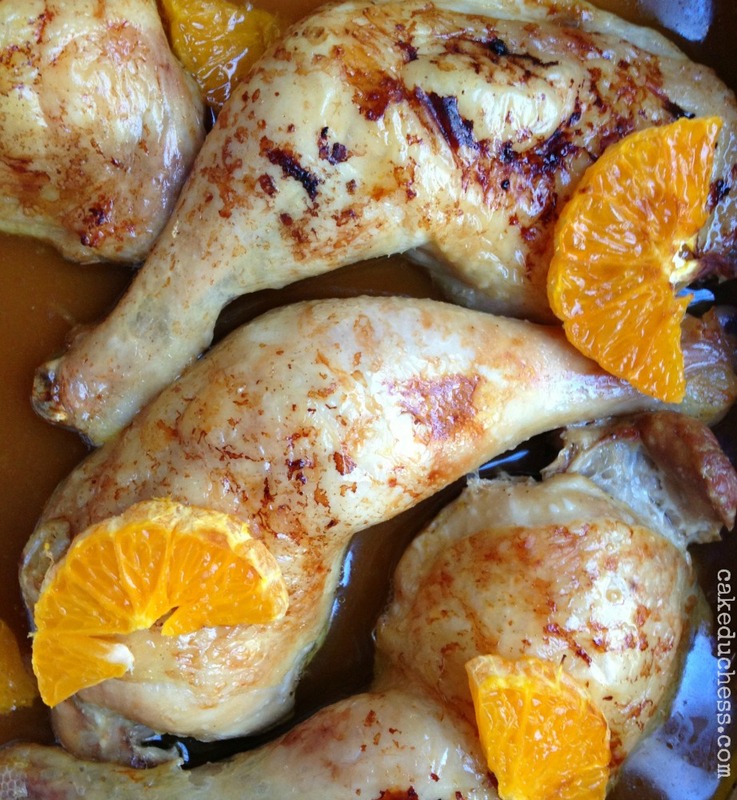 An easy baked chicken recipe made with tangerines and garlic. Preheat oven to 400 degrees. Arrange chicken pieces on a foil rimmed baking sheet. Drizzle chicken with olive oil and rub it around on both sides (this helps it from sticking to the pan). Add garlic to pan. Roast 30 minutes. Whisk together the soy sauce, teriyaki sauce, honey and tangerine juice. Remove pan from oven and spoon juice mixture over the chicken. Add the tangerine slices around the chicken and the pan. Return to oven for another 20-25 minutes, until chicken is cooked through. *I check the chicken a couple times and baste it with the sauce. If it seems dry, you could add a little bit of water to the sauce (a Tablespoon at a time). I'm drooling, Lora…what absolutely GORGEOUS chicken!!! Thanks for sharing this wonderful recipe!!! Going to have to make this for sure! Sounds a delicious chicken dinner! Hi Lora! This looks delicious. Easy yet flavorful. Don't you love adding citrus to chicken? Thank you for sharing this. I hope to make it soon! 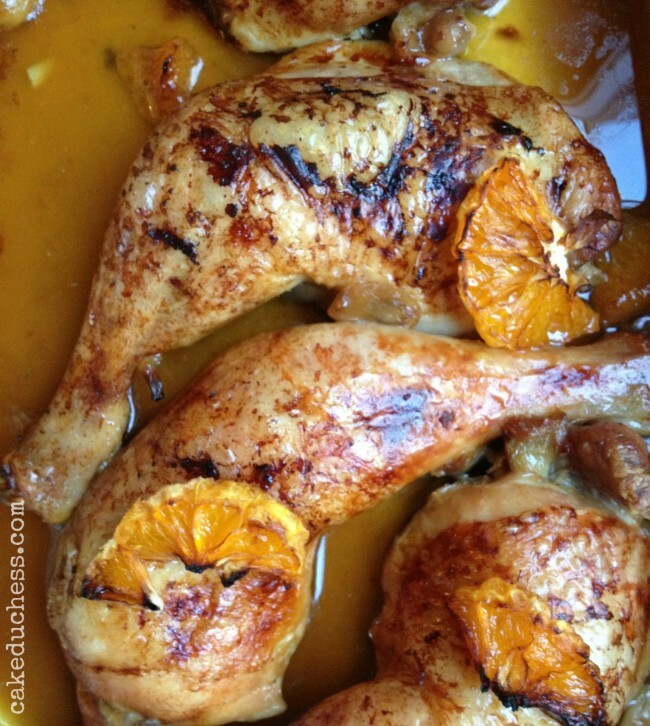 Mouthwatering chicken, I love the tangerines and garlic! OH MY GAH! LOVE THIS! We would fight for the last one… yummmmmmo! It helps to only have a hubby here at home. We don't mind warming up our dinner but when the kids and grandkids are here, I don't dare. I give you credit for attempting this and your photos look like you had all the time in the world! This chicken sounds amazing, I love that the sauce is so versatile. I think I'd like it with bone in chicken breasts! Wow wow wow! This is so my kind of chicken dish. The combo of soy, teriyaki and tangerine must be stunning and I'm so copying this. Gorgeous. And easy to boot. Beautiful dish, Lora! I eat quite a lot of chicken so a new to me recipe is always welcome. This is going to have to be a must try. This is my kind of meal, Lora. I just want to dive in and grab a leg and start chowing! Looks delicious & love how simple it is. Pinning now!! Wow Lora, this is the kind of chicken recipe that I LOVE!! I have to buy teriyaki sauce right now and make it this week. I already have the tangerines! Interesting that your kids like it so much. My kind of dish! Citrus and soy are a match made in heaven…yum! I tried the recipe last night. It was very tasty, but I couldn't taste the citrus at all. I would recommend adding more than 2 tablespoons. How much chicken…i don't see in recipe…? It is 2 lbs (legs or thighs or both). Enjoy the recipe!